I added this page January, 2015, for several purposes. To save in one place information about places I want to experience a meal, and then share that experience with you. And, if you have a dining suggestion, I would love to hear of it. Chains do not appeal to me. An old inn or tavern with a dining room (either Colonial or Victorian) with a unique charm and atmosphere is a must. But also the food must be something “to write home about.” I have always enjoyed classic diners which have their own special fare, and I stop at old general stores or delis on back roads to sample their wraps or special plates. On those stops, usually BLACK BEAUTY or BLUE BELLE is patiently waiting outside. At some stops I can enjoy my meal on a porch, or nearby bench. As I develop this page (and it will be constantly changing) my initial criteria is listing eating options within about an hour drive of home, but I will expand out and share special places even further. 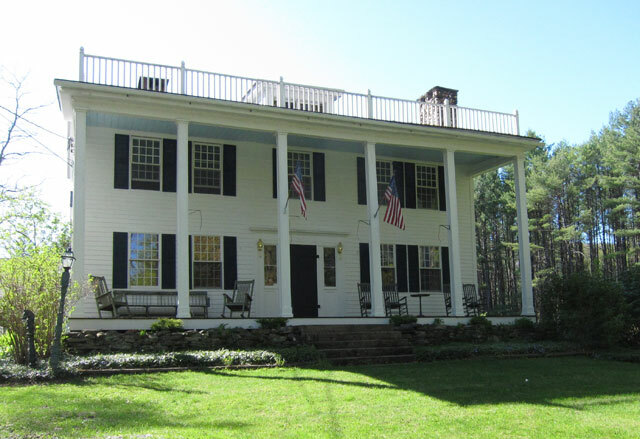 The Birchwood Inn, and its previous owners, Bill and Judy, is part of my history in being in New Hampshire. In the late 1990s I could not keep on my bookshelves copies of Jean Lipman’s book, RUFUS PORTER. Rufus was an itinerant muralist in the mid-19th century, decorating homes in New Hampshire and Maine. I was hooked on his work. When book buying in New Hampshire Cathy and I stayed here (because of the original Rufus Porter murals), and Bill’s gourmet meals were sensational. But they retired and sold, shortly after a long evening talking with them about why we should move to New Hampshire. The gentlemen who purchased the inn turned the theme into an English Pub. 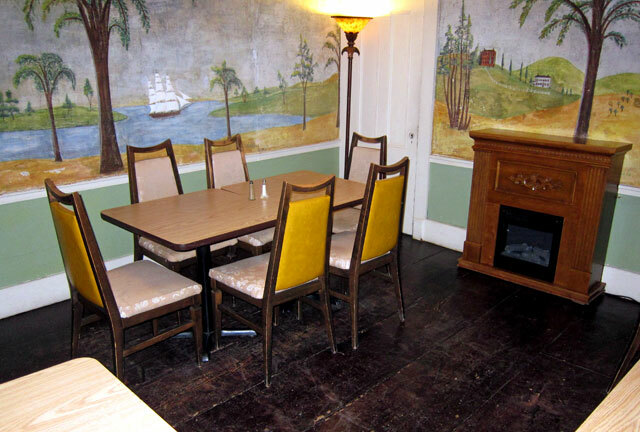 I visited last in 2008 taking friends, and had to ask to eat in the Rufus Porter decorated room. I revisited with a friend on 29 January 2015, but was escorted into the “new” English pub. Sadly, very, very sadly, the original dining room is furnished with naugahyde and formica with a faux fireplace, and appears to be the last seating choice. Shame on those chairs and the faux fireplace. But the murals are wonderful, and valuable. The pub area and two dining areas are nice, but I would recommend that all the “new” hideous seating and tables be replaced by wood. Hey, you can buy great old chairs for $5, or a tad more. And mismatched is cool! Hey guys – you can improve the ambiance and the lighting. Meals, however, are reasonable, plenty, and British (lacking in color). But we left satisfied, albeit not having engaged in “fine dining.” It was wonderful to see many “locals” in the pub room – the area needs such a venue – good work on that. If you are cruising down NH 101 between Peterborough and Wilton, I do suggest that you stop in and sample. After all, that is what life is all about. My Chicken Supreme – filling and good. Chesterfield Inn, Chesterfield, NH — This was the visit in early January, 2015, that convinced me to finally start this page. Sadly I forgot my camera, but here is an image I captured from their website. Here is what I posted on Trip Advisor: “Lived in the area for 12 years, and had not been to the Inn for dinner yet. Asked a friend to join me for dinner, and she had not been there for 20 years. Lovely setting (particularly in the snow), welcoming entrance with fire and friendly greeter, impressive common areas and dining room, and then the meal !!! Great menu, and we both opted for the ‘Roasted Chicken Breast with a Maple Bourbon Mustard Sauce and Mission Fig Jam.’ First, to our surprise, we were served a mouth watering salad. We will be back, and this visit will be the first I write about in the new section (Culinary Excursions) in my “shunpiking” travel blog.” And here is owner, Judy’s, reply: “Thanks, Ray! You were here for the beginning of the Winter menu, and I’m glad that you enjoyed the Chicken with the Maple Bourbon Mustard Sauce. Salad, homemade bread and savory muffins come with all of the entrees. Chef Bob’s salad dressings are so delicious; he gets the balance of tart and sweet perfectly.” The salad dressing was so amazing I could not even properly describe the savory experience — glad she did. MY RECOMMENDATION — Hurry to the Chesterfield Inn for a quiet and phenomenal experience. Hancock Inn, Hancock, NH – GREAT – write up to come. Woodbound Inn, Rindge, NH – GREAT NACHOS at the bar in 2014 !!! Fitzwilliam Inn, Fitzwilliam, NH – HORRIBLE NACHOS at the bar in 2014. Colby Hill Inn, Henniker, NH — just rediscovered this on-line November 2017 — sounds great – must do soon. Bantam Grill, Peterborough, NH — Here was a real pleasant shocker. 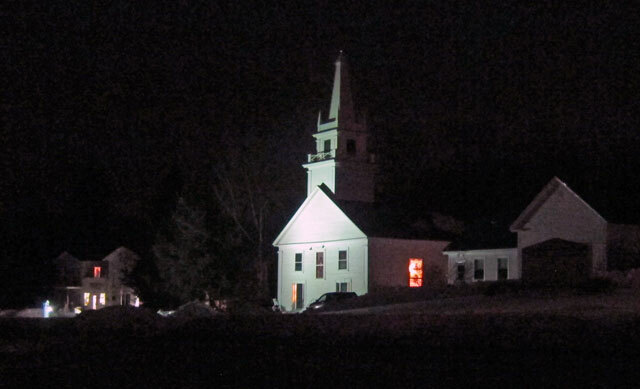 Following a sleigh ride at the Silver Ranch in Jaffrey the last day of January, 2015, the group decided to have diner on the way home. Now, who would think great food would be in a little “strip mall?” We stopped at the Pearl Restaurant (which friends knew was good) only to find that they were booked for the evening. “Head over to our sister restaurant,” the hostess suggested. And, we walked three doors down to Bantam Grill. Fantastic specialty bourbon cocktail with mulled cider, and bacon infused with brown sugar. I enjoy French Onion Soup, but did not like theirs made with Gruyere Cheese. 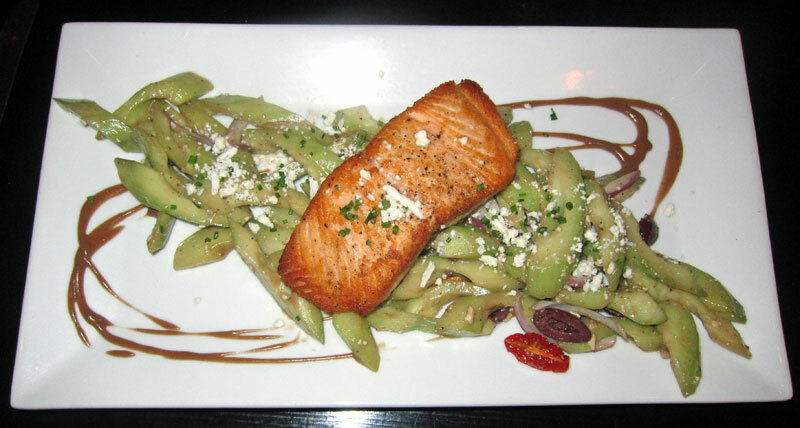 BUT, my Pan Roasted Salmon with Feta Cheese, English Cucumber Salad, Kalamata Olives and Balsamic Vinaigrette – WOW. Click on image below for a more mouth watering view. Ambience was nice considering I was not in a 200 year old inn (my downfall), but food quality matters. So if in Peterborough, you can find Bantam Grill just south of Route 101 on US Route 202. 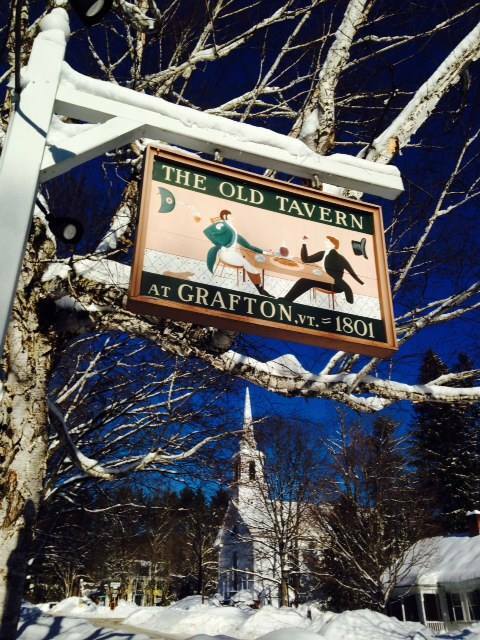 The Grafton Inn, Grafton, VT – another special place in the history of my move to NH. Great “fine dining” never a bad meal. Phelps Barn Pub, Grafton, VT – BLUE BELLE and I went one evening in 2014 for Burger Night. Cannot wait to return with friends for top-down evenings out. Back several times 2015/16 and 2017 with friends for wine and appetizers in front of the fire. And, enjoyed Trivia nights. Do go. Inn at Weathersfield, Weathersfield, VT — write-up over due. This image is when BLUE BELLE and I first stopped in May, 2013. A favorite now of mine. Landgrove Inn, Landgrove, VT – Had dinner there in 2016 — ready to go again. Great ambiance in the middle of bucolic no-where Vermont. Dorset Inn, Dorset, VT — since 1796 – On the Green – this is my kind of place. History, ambiance, original features, great common rooms. Been “on the list” for decades, and finally made it for dinner 11 November 2017 — worth the wait, and cannot wait to return. After a wonderful afternoon tour through the countryside we arrived, and had a peaceful and relaxing two hour visit. I had the recommended popular ROSEMARY & GARLIC GRILLED PORK RIBEYE, and my dinner partner enjoyed the evening’s special SCALLOPS. RAY RECOMMENDS – VISIT SOON, and ask me to join you. Peter Havens, Brattleboro, VT – Top rated. Cathy and I had a wonderful dinner 15 or 16 years ago – overdue getting back. Fullerton Inn, Chester, VT – often stop for dinner on the porch after a day’s outing. But see what is next. Ushered to partially set table in almost empty room. “Your server will be with you soon.” After long wait owner/manager returns, “no water yet?” Saying server will be by, he gets water and forks. “Go to the buffet line when you want,” he then says. Still no server, he gets us wine asking as an afterthought. Buffet line sad. Small poorly cut meats, mashed potatoes, mashed squash, Mac and cheese. I do not remember any other vegetables, nor did I find cranberry sauce for TDAY. Return to table – bread plates have appeared, bread never did follow. Server stopped by, sort of clueless. At one point she took away some empty plates (not all), said we could go to desert table in other room. I really wanted pumpkin pie – looked rancid. When I asked why the strange color, and if maybe squash instead, I was told it was because it was homemade. Wish I had brought a saw, barely got through it with my knife. Choose not to use aerosol can of whipped cream sitting next to pies – really classy – not. Sadly, definitely not worth the price or the time. Glad I was with a friend and we could laugh about the horrendous experience. If I were on a date I would have been terribly embarrased. Have stopped in summers for diner on the Inn’s porch, do not recall the experiences in detail, so probably not outstanding. 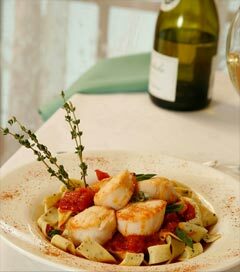 I remember my good experiences, and document my travel and meal experiences on my travel blog. I “vote with my dollars,” and will not be returning to the Fullerton Inn. Only wonder what the accommodations are like. Echo Lake Inn, Ludlow, VT – Stayed here in the late 1990s before living in NH. BLACK BEAUTY and I stopped for dinner on the porch several years ago. UPDATE 15 July 2015 — what a fantastic treat – RAY RECOMMENDS – Hurry to Echo Lake Inn. I was touring a friend to my favorite nearby Vermont spots, and we never had time for lunch. Leaving Plymouth Notch we arrived at Echo Lake Inn before the dining room opened at 5:30 but were graciously welcomed by the new owner, Tom Gianola, and his staff. Wonderful relaxing atmosphere, no rush, sip a glass of wine, and review the menu. For appetizers we settled on the Vermont Cheese Plate with Jasper Hill Hazen Blue, Blythdale Farm brie, Cabot cheddar Macintosh apple slices and Smokeshire Hilltop Farm honey drizzle. The honey drizzle was amazing. I also had the cold Blueberry soup – also wonderful. 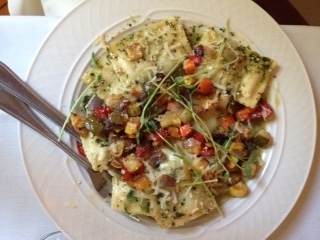 For entrees, my friend had the Vermont Fresh Pasta Ravioli filled with impastata ricotta and lemon asparagus with roasted summer vegetables and basil pesto. (I got to eat the “doggie bag”). 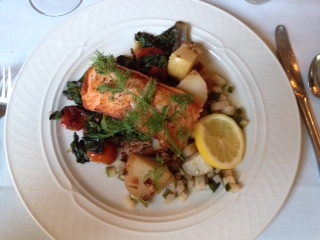 And I had, Pan Roasted Faroe Island Salmon, seared tomato and chard with a lemon-dill cucumber relish. Instead of rice I chose a special potato (sorry forget what it was called). The flavors, presentations were in my estimation ONE OF THE BEST MEALS I HAVE HAD in my travels. I cannot wait to get back with a group of friends, and encourage you to visit very soon. The dining room is open everyday except Monday; but, usually on weekends in the summer they are booked on weekends for weddings and events. Before we left we were able to speak to the chef, Chris, and compliment him, and again thank Tom for a grand evening. I just read on their website you can print out a coupon for a free appetizer or desert — so print-out and hurry and visit. 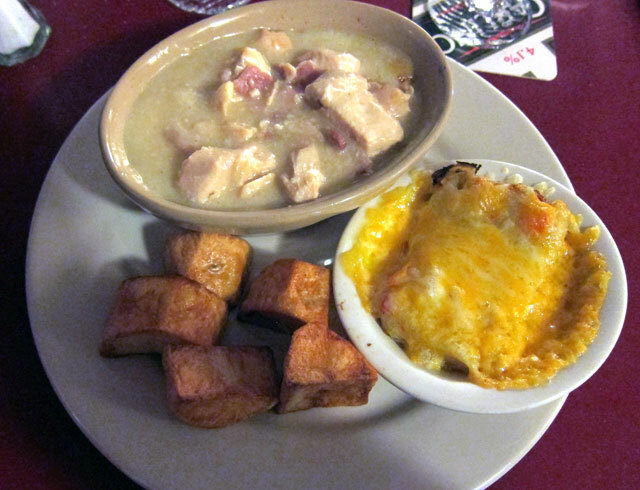 Hen of the Wood – Waterbury or Burlington, VT – highly recommended by a neighbor March, 2015, and a tad further away, but can be a stop after a day’s outing, or evening meal with an overnight. Looking forward to providing a report. I have driven this section of US Route 7 through Stockbridge (immortalized by Norman Rockwell) for over 50 years, but first stayed at the Inn in February, 1996. And, the Inn for me is full of memories and comfortable traditions. 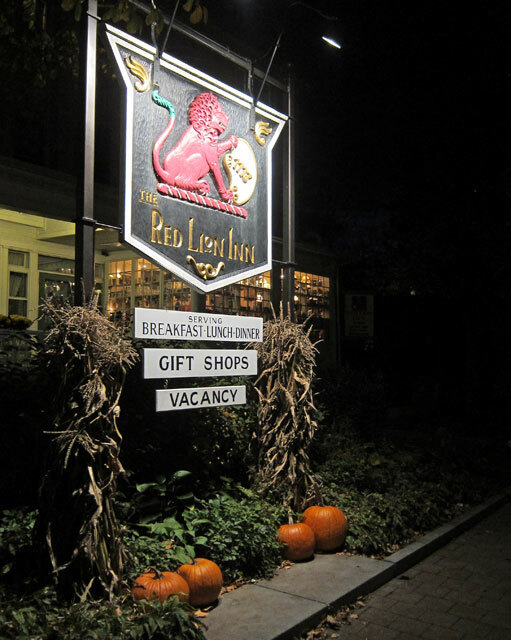 Use my search engine to see all I have written about The Red Lion Inn, and RAY RECOMMENDS – START YOUR OWN TRADITIONS HERE !!! BASCOM LODGE atop Mount Greylock — ADAMS, MA — I camped on Mount Greylock in my 1929 Model A Ford in the early 1960s, but do not remember the top of the mountain. But a visit for dinner (watching the sun set over the Adirondacks) and possibly an overnight has been “on the list” since I started restoring BLACK BEAUTY in 2010. What a great trip and experience with the top down. Made it here in 2017 — and click on this link to see images and read about the adventure. 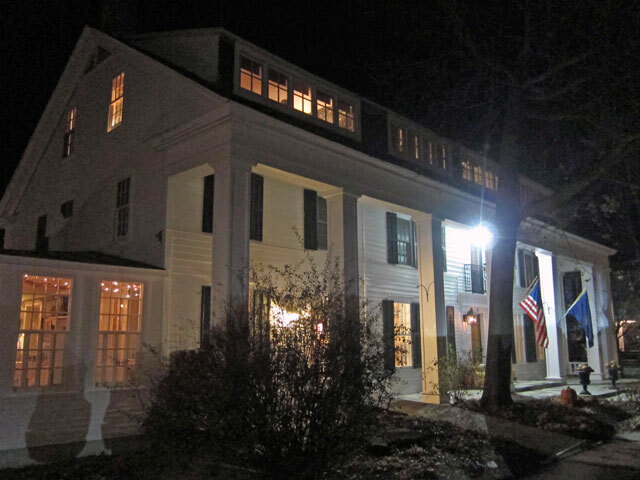 Deerfield Inn – Old Deerfield, Massachusetts — I love visiting Old Deerfield, and have been driving through for decades. Had many great lunches here (sorry, no images), and look forward to dinner and an over-night stay. Looking forward to more food cuisine.